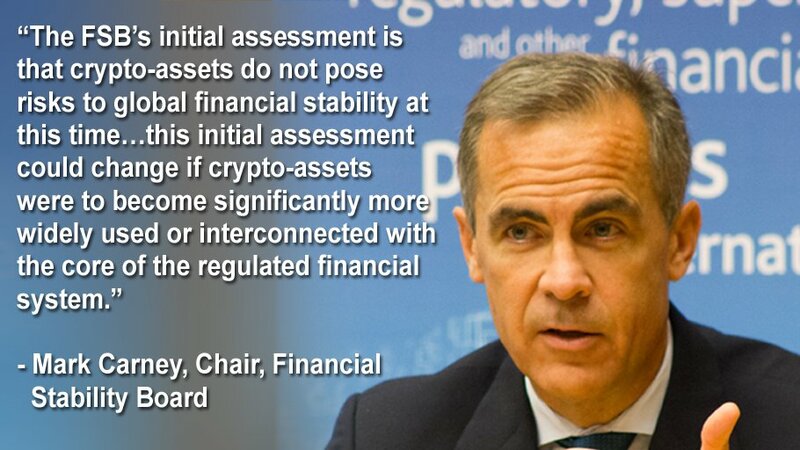 In his official report to the G20 summit of Finance Ministers and Central Bank Governors, Financial Stability Board (FSB) Chair Mark Carney told regulators that there was no need for global regulation of “crypto-assets.” Carney, who also serves as the Governor of the Bank of England, said that the rapid growth of crypto-assets prompted the FSB’s review, which ultimately found that bitcoin and other blockchain-powered financial technologies “do not pose risks to global financial stability at this time” due to the relatively small size of the cryptocurrency economy. 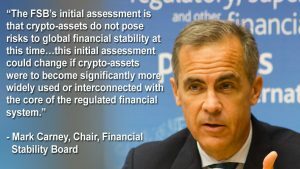 The FSB report did suggest that regulators and financial institutions continue to monitor crypto-assets, as the “market continues to evolve rapidly.” Instead, Carney suggested that the still-growing industry be given room to grow, explaining that “the technologies underlying [crypto-assets] have the potential to improve the efficiency and inclusiveness of both the financial system and the economy.” The report also recommended coordination between various international financial organizations — such as CPMI, FATF and IOSCO — to update existing financial and legal frameworks to include crypto-assets. Although the FSB is an advisory organization without any binding legal authority, the group’s recommendations are generally adopted as official policy by central banks and other international institutions. Their primary role is to assess risks to the global financial system, providing policy advice with the aim of reducing disruptions. Now that the FSB’s official position on crypto-assets regulation is essentially “not yet,” it’s likely that the G20 nations will focus on other regulatory priorities in the near future. That’s good news for most cryptocurrency investors and blockchain-rleated startups. It’s also proven to be good news for cryptocurrency prices, which have experienced significant rebounds following the release of the FSB’s report.